If you are looking for a nice house in Tallahassee, I recommend a structured home buying process to ensure that you get an exceptional deal. Anybody can just jump on a property search tool and look until they find a house that they like, but how do you find a nice house and a nice deal, all at the same time? We can take a snapshot of the Tallahassee real estate market to see why working with the right tools can give you an insight not available to the typical buyer who merely works with "their friend." We could have picked any price range to conduct our analysis, but nice houses priced between $300,000 and $500,000 in Tallahassee offer significant diversity and will demonstrate just how important market knowledge is when you go to buy a home. 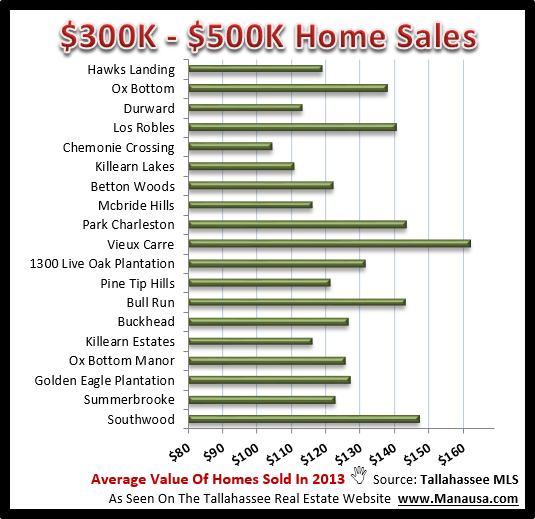 Currently, there are 272 homes for sale in Tallahassee priced between $300K and $500K. The first real estate graph in our report shows the most active neighborhoods in Tallahassee where you can buy a nice house priced between $300,000 and $500,000. Southwood was the most active neighborhood in this "executive house" neighborhood, and it was the rare exception not being located in the NE quadrant of the Tallahassee real estate market. How Nice Is Your Nice House For The Money? So we have a good idea for WHERE to find a nice house in Tallahassee, but wouldn't you also like to know what you can get for the money? If you are flexible on the location in which you'd like to live, the next graph shows the differences between property sizes for the money in homes priced between $300,000 and $500,000 in Tallahassee. All of the sudden, our graph has a completely different look (note that the neighborhoods in the left sidebar of the graph are still organized in the same order as the first graph in our post). Furthermore, if we were to take the same data and plot average home values (price per square foot), we would get an even different view. 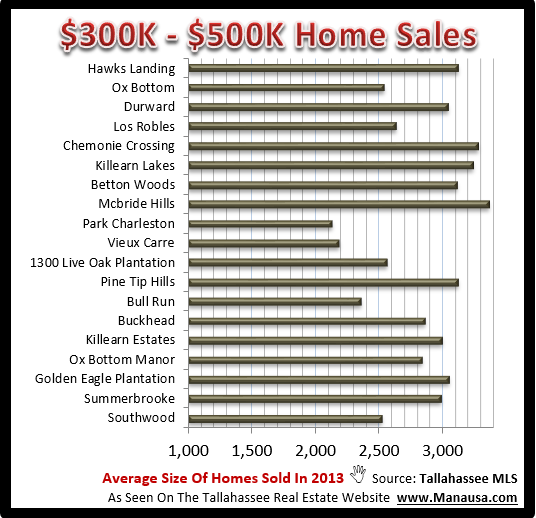 Once again, the neighborhoods are organized in the same order as the graphs above, but this time we can see the value differential for a nice house in one Tallahassee neighborhood versus another. 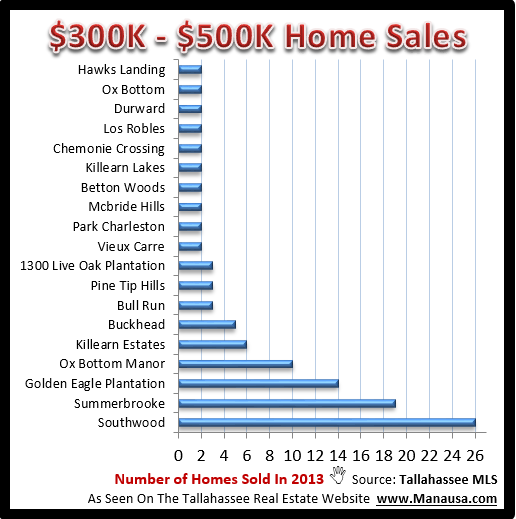 There are quite a few options to buy a nice house in the $300,000 to $500,000 price range in Tallahassee, and armed with current information, you can make an informed decision when you decide to buy. I hope this case study offers some ideas on how to explore the housing market in detail, and when you are ready to buy a nice house in Tallahassee, just drop me a note and we'll be sure to take great care of you.